This chart shows financial segmentation of the 46 million Americans over 65 years of age. The top 9 percent can afford all the 24 x 7 care they need, expensive continuing care retirement communities or other senior housing options. 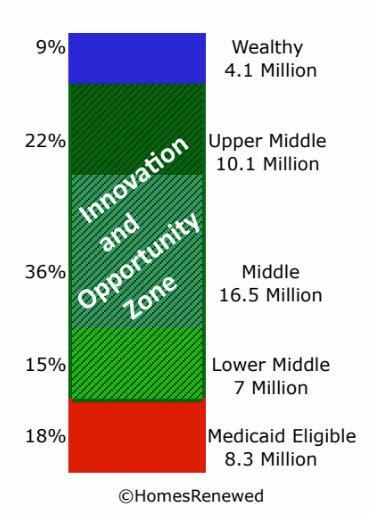 The bottom 18 percent receive forms of government long term care assistance including Medicaid. There is no government funding of long term care needs for Americans who are not poor. Nothing informs or encourages the middle 73% of Americans to prepare for their long term care housing needs. The 73% is a huge population. They must fend for themselves with no housing policy or not-for-profit programing. They are not uniform in health or financial capability. As a startup, HomesRenewed’s initial focus is the top segment of this opportunity zone. This is the 22% of older Americans with $100,000 or more of pre-tax retirement savings in 401K, IRA, TSP or have other workplace pension plans. This is the easiest starting place because individuals can invest their own money on home upgrades. Once HomesRenewed benefits are proven in the marketplace, we will seek other finance sources for the other opportunity zone segments.